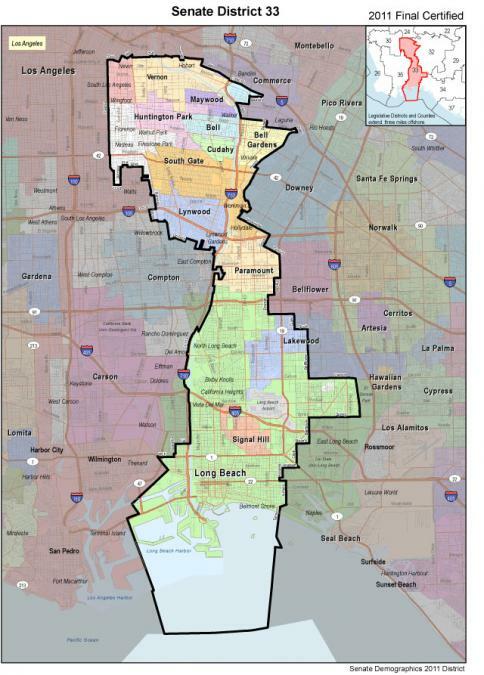 SD 33 is based on nesting AD 63 and AD 70 and includes the Los Angeles County cities and communities of Cudahy, Bell, Bell Gardens, Lynwood, Maywood, Signal Hill, Paramount, South Gate, Vernon, Walnut Park, Huntington Park, and most of Long Beach with portions of the cities of Lakewood and Los Angeles to achieve population equality. To the north this district includes part of the group of Southeast cities of Los Angeles County: Vernon, Huntington Park, Bell, South Gate, Cudahy, Lynwood, and Paramount. These Southeast cities are grouped together because of their socioeconomic commonalities and because many unincorporated areas share similar civic and economic issues. Many of the residents in this region are first-generation immigrants with similar linguistic and educational characteristics. This district is characterized by high residential density and many historic neighborhoods, heavy industry, and common environmental problems linked to transportation corridors. The majority of Long Beach is kept with its port, Long Beach City College, and downtown Long Beach.